ATTENTION - Rates for 2020 are starting to book. 2020 calendar is starting to book. GET YOUR 2020 SPRING or SUMMER VACATIONS RESERVATIONS WHILE YOUR DATES ARE AVAILABLE. Please contact us if you submit an inquiry and do not hear back from us within 12 hours. We strive to provide a prompt response to all inquiries. Seawind 1809 is a well appointed west corner unit with amazing sunset views over the beach and Gulf and is located only 3 blocks from the 'T' and beach concerts. Stay here and you can walk to the concerts and restaurants. Seawind is a low density building with 20 floors, on-site check-in and property management, beautiful white sand beach, gulf front exercise facility, two pools including an inside/outside heated pool and a children's interactive pool, and covered parking. The living room with a leather sofa, side chairs (2 are recliners), and an ottoman should provide plenty of seating for your family and friends. The kitchen has granite countertops ,stainless appliances, and all the little things to make it easy to prepare a meal on those days you just want to lay back and relax taking in the awesome views. The condo has king beds in the master & guest rooms, the bunk room has a twin over full bunk bed, and the sofa opens to a queen size bed in the living room. There are flat panel HDTVs in all rooms including a selection of movies to keep everyone busy on those rare rainy days. Please let us know if you have any questions regarding our beach condo. If this condo costs too much for your budget then check out our new condo located in Gulf Shores at the Peninsula Golf and Racket Club. www.vrbo.com/1540584 Only a short walk to Mobile Bay and a short drive to the beach. After several years of talking about purchasing a beach home and lots of looking we finally found 'the one'. We were presented with the opportunity to purchase this awesome condo in December 2012. We are enjoying updating the condo to reflect us. Hope you enjoy our second home as much as we do. We purchased this property because we prefer to be able to sit back, relax, and enjoy the peace and quiet of this beautiful white beach. The beaches here are beautiful. From this location it is possible to just park the car and walk to everything! Renting this condo will allow to you to work directly with the owners and skip the hassle of having to go to an office somewhere to check in to get access to the condo and parking passes. We will provide the access code to the door the week prior to your arrival. Your parking pass(es) will be waiting for you inside the condo. Both bathrooms are a tub/shower combo. Only 2 blocks to the center of Gulf Shores so you can walk to anything you wish to do while relaxing at the beach. 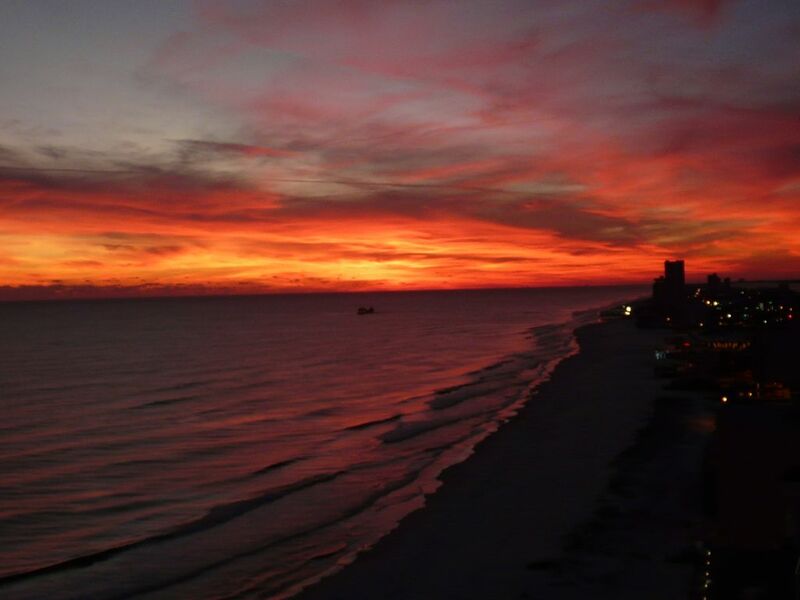 Located right on the beautiful natural white sand beach of the Gulf of Mexico. Can't get any closer than this! Located right on the beautiful natural white sand beach of the Gulf of Mexico! Located on the white sand of the Gulf of Mexico beach with 225 degree views of the beach and downtown Gulf Shores from the balcony. Please do not run the Air Conditioning with the doors open. Full Size washer and dryer in the condo. Full size. Please, do not place items in the dryer without first washing them. Sand destroys the dryer. Clean the lint filter each use. The complex has a gym overlooking the beach. Access code for the secured internet can be located on the entertainment center in the living room as well as the electric panel cover in the laundry room. You will find coffee filters as well as miscellaneous spices left by previous guests. You will be set up with initial paper towels, toilet paper, and dishwasher detergent. Granite countertops and stainless steel appliances. Well stocked with everything you need to prepare meals for your family. The dining area adjoins the living room and seats 6. There are also 3 stools for the bar. HDTVs in living room and all rooms with beds. From time to time people will leave books in the living room to share with the next guest. Feel free to add to the collection. Some board games and cards have been provided for the entire family. An assortment of movies for all ages can be found in the living room. Extra large unobstructed of the gulf and west to Fort Morgan and Dauphin Island with comfortable tables, chairs, and lounges. Enjoy the 225 degree view! Golf is available nearby at numerous courses. Great condo right on the beach. The kitchen is well stocked with all necessary items to cook and dine in. Our family of five really appreciated the three bedrooms and two bathrooms, there was plenty of room for all of us to spread out. The sand shovel and sea shell bag where a nice touch. My son liked the shovel so much for making sand castles I bought one to bring home. I would highly recommend this unit to anyone considering it. The condo was spacious and comfortable . The only thing we had an issue with was not enough towels, which necessitated doing laundry, not really a big deal. Otherwise everything was fine. Plenty of dishes, glasses, utensils, etc. really enjoyed our stay. We loved everything about our stay in 1809! Everything was very clean and there was plenty of room for our family of 5 to stretch out and relax! The balcony is very spacious with the most amazing view of the Gulf! We prepared most of our meals in the condo and found that the kitchen was very well stocked and we had everything we needed. This condo is tastefully decorated with very nice bed linens as well! We appreciated the attention to detail the owners have taken with this condo! The next time we come to Gulf Shores we will definitely try to book here again! This condo is not only in the perfect location for fun, sun and good food, it is also a beautiful place to call home during your beach vacation. Everything you need is there. Just unpack and enjoy! Thank you Gayle and Gary for sharing your perfect spot for the third year for our girls get away. * Festivals, holidays, and school breaks may be higher. Security deposit may be increased and damage insurance required. Single night rentals are accepted as long as it completely fills a break in stays. Taxes and all fees have been included in quotes. No additional charges when you check in. All rentals require $250 refundable security deposit to book stay which shows separately on quotes - refunded within two weeks after departure.